It looks like a judge has looked into his soul and determined that separate and unequal treatment is not so bad after all. The UFT and the NAACP sought to block charters from invading and debasing public schools, but no dice, so Bloomberg and Walcott will move ahead with their plans. Feinman ruled that the UFT and NAACP had not proven that schools facing closure would have performed significantly better if the city had fulfilled all of the promises set out in an agreement that followed a similar lawsuit last year. You gotta love a judge who can definitively decide what would've happened if other things in the past happened. I don't know anyone who can do that. Furthermore, it's heartening to see yet another affirmation that Mayor Bloomberg need not follow the law, since there are no consequences whatsoever when he breaks them. After all, though the closings were blocked last year, he went ahead and dumped new schools in their buildings anyway. Oops. But hindsight is blind in this case (except for the utterly baseless speculation on which the decision was based), so it's all good. Schools Chancellor Dennis Walcott applauded the decision, which he said validated the Bloomberg administration’s approach to fixing low-performing schools. That's one of the most remarkable things I've ever heard. In fact, he's not fixing the schools, even assuming they are broken. He's closing them. And when he does that, troubled kids end up attending neighboring schools, which are also closed. By Walcott's logic, Katrina saved New Orleans, and an atom bomb saved Hiroshima. 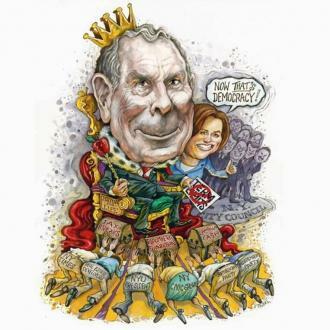 And now, a judge has cleared the way for Michael Bloomberg to continue saving New York City public schools.